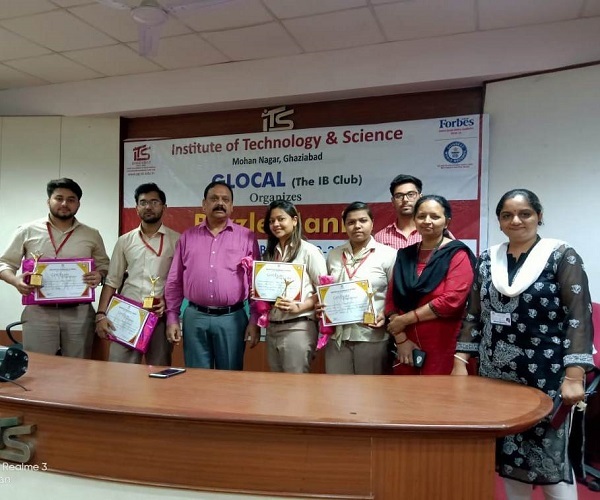 IB club “GLOCAL”of Department of Management at I.T.S Ghaziabad organized a competition for MBA students. The activity was designed to stimulate the inquisitive approach of the students. 60 students took active participation in the activity with excitement. 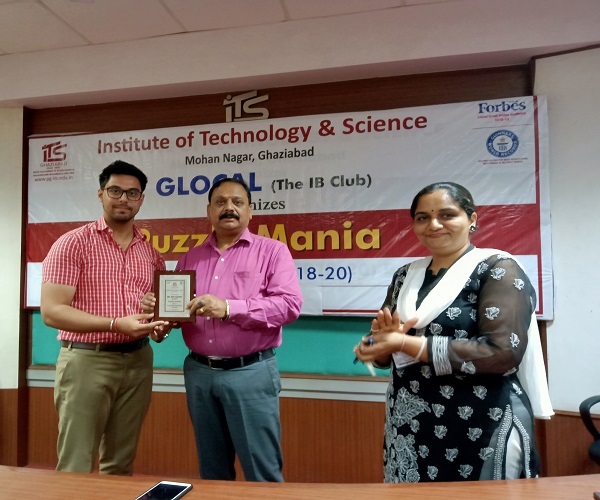 The first round was based on Crossword puzzle and it witnessed excited participation of 30 teams comprising of two members each. Top 8 teams reached the second round and were asked to solve intriguing riddles based on IB and Economics related concepts. The audience round designed to involve the non- participants as well, garnered huge enthusiasm and participation from the students. An electrifying final round made the event all the more exciting. In this round the teams were given picture puzzles of IB and Economics related entities which they had to solve in given time limit. The team comprising of Mr. Vaibhav and Mr. Abdul secured first position. Second position was claimed by the team of Ms. Vidhi and Ms. Mansi Gupta. As it was the last activity of the club in the session 2018-19, the final year office bearers of the club were also felicitated during the ceremony. They were presented with an appreciation letter and trophy for their contributions. All the winners were awarded with a certificate, trophy and attractive prizes by the honourable Director- Management Dr. Ajay Kumar. The main speaker was Ms. Pooja Atal Singh, Sr. Director - People Strategy at Publicis Sapient. The topic for this episode was R&R Strategies for Manager and Leadership: Recognition Matters at All Levels- An Overview. 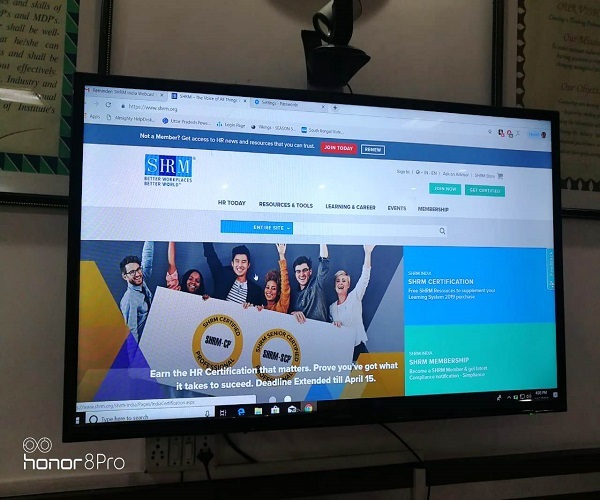 Ms. Pooja gave a microscopic view on the importance of having customised R&R strategies for leadership and managers with the millennials climbing up the ladder to become managers. The speaker also discussed about key rules i.e. decoding the future of leadership and manager engagement with regard to R&R strategies, the involvement of leadership and managers in driving engagement at the workplace and the key drivers for leadership and manager engagement. Ms. Pooja concluded the session with a summary about how to retrofit minor changes in the overall R&R strategies to make it relevant for managers and leadership. 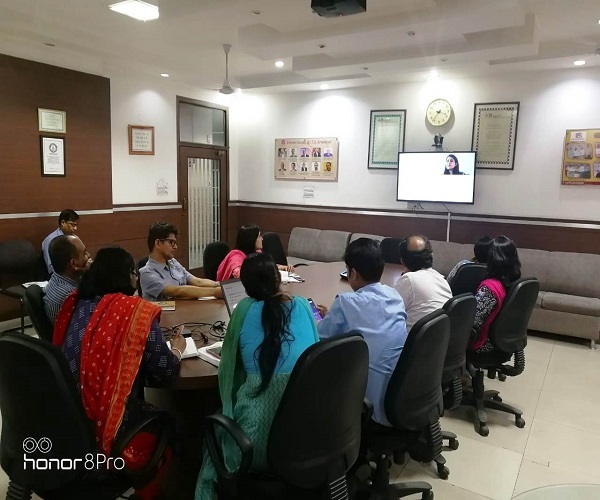 The webinar was highly interactive and informative and appreciated by faculty members and students present. 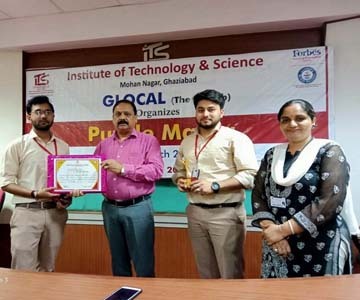 Department of Management at I.T.S Ghaziabad organized a Merit and Performance award ceremony for MBA 2018-20 and MBA 2017-19 batches on 15th April, 2019. The ceremony began with a brief introduction by Dr. Anusha Agarwal-Chairperson MBA Program about the inspiration behind the idea of the Awards given by the Institute. 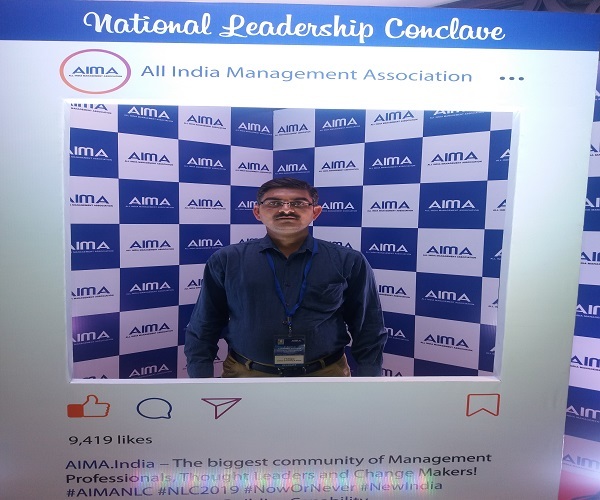 A motivating speech by Director Management-Dr. Ajay Kumar highlighted the importance of small achievements and efforts of life which cumulatively become big for future. He congratulated all awardees and their parents for the success of their wards. 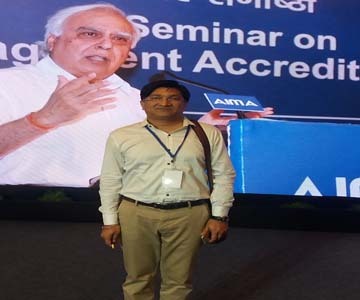 Honorable Vice Chairman- I.T.S The Education Group Shri Arpit Chadha addressed the students & revealed the importance of competition amongst the students. He motivated students to have the spirit of continuous improvement & how success changes itself with passage of time. Parents of the award winners also joined their wards during the ceremony for receiving the award. • Top 10 position holders in MBA I Semester University exams. • Top 10 improvements in MBA III semester over MBA II semester University exams. • Top 10 position holders in MBA III semester University exams. Total 30 students were presented with certificates by the dignitaries under the above categories. The vote of thanks was delivered by the MOC who congratulated all the awardees and thanked the dignitaries, faculty members, parents and students for their presence. The event culminated with a Hi-Tea for Parents & Awardees. conducted the activity, with the thought that, In times of continuous flux, cherishing and valuing cultural assets gains precedence. This is specially so when countries across the globe have showed a renewed interest in indigenous cultures. 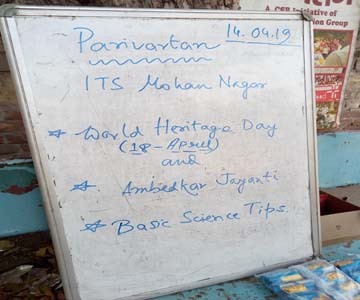 Hence it was apt to take cognizance of World Heritage Day at Parivartan. Alongside this, a brushing up of basic science concepts is always in order. Astha opened the day’s classes with a discourse on heritage and the importance of the World Heritage Day. 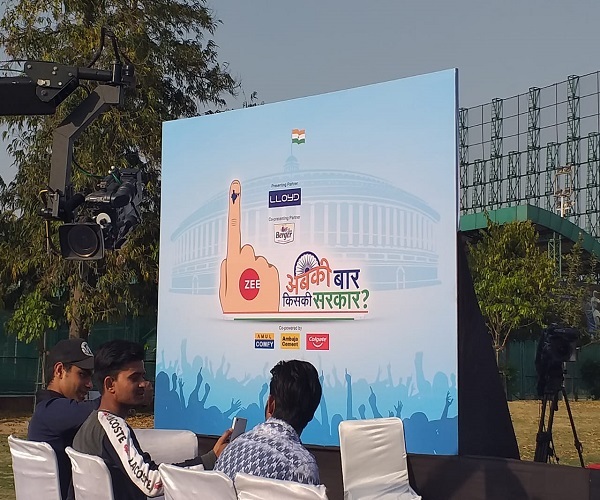 In order to convince the children about the significance of heritage in the growth of a nation, she held up instances of some of the major cultural landmarks of the country like the Red Fort and the Taj Mahal. Then it was the turn of Sachin to continue with a short reminder about Ambedkar Jayanti. 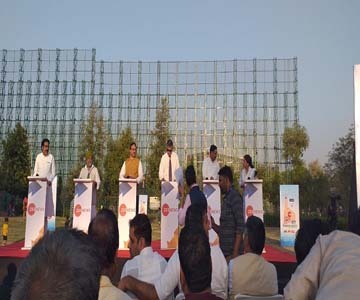 He referred to the life of Dr Bhim Rao Ambedkar and his role in the enactment of the Constitution of India. He then proceeded to the main topic regarding the basic elements of science. He explained how science can be classified into physical, chemical and biological components. He also inspired the kids with anecdotes from the lives of great scientists like Albert Einstein. Shudhanshu joined in occasionally to help him in this endeavor. The regulation quiz was employed to round off the day’s learning, those giving correct answers being rewarded with toffees. Finally it was time to close for the day with the distribution of ‘Britannia Good Day’ and ‘Parle Orange Bite’. 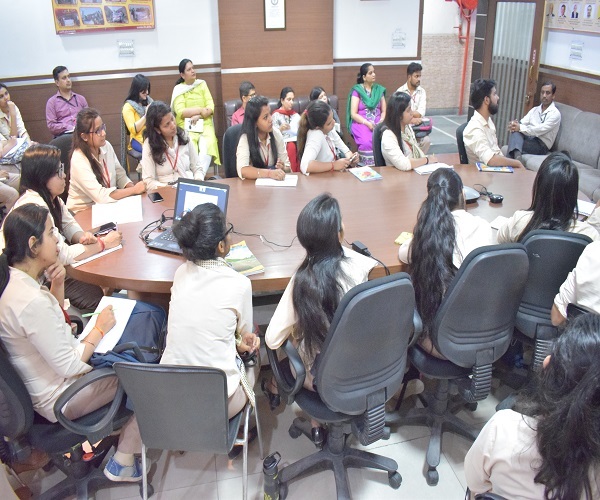 as IT Companies are looking for young minds who have excel in Technical Skills as well as business communication skill essentially English in addition to the sound aptitude and attitude with suitable leading IT degree.By keeping this view, 9th series of SAMVADIX(Group Discussion Series) was planned during January – April 2019. 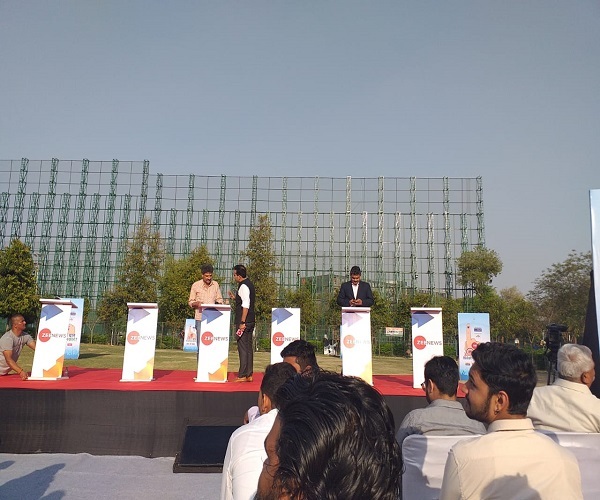 The Grand Finale round held on 12th April 2019. At the outset of the event, Director –IT, Dr Sunil Kumar Pandey concluded the session and motivated the participants of final round. 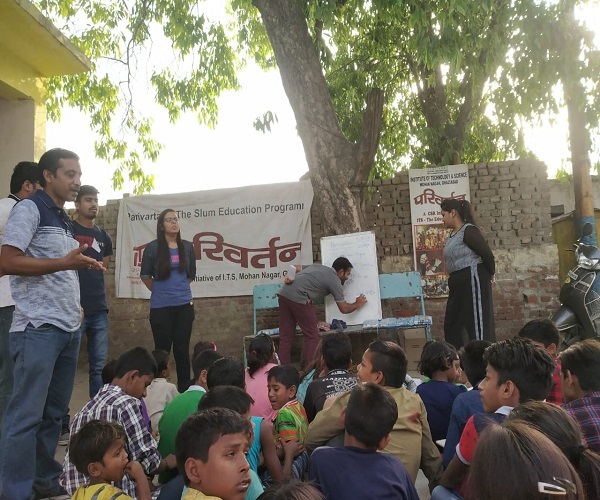 He elaborated the need and importance of the communication skill not only for their holistic development but also will pave the way for their placement. During his talk, he pointed out the necessity of the debating skill to grow in the corporate ladder. At this occasion faculty members and students were present to be the witness of this high level debate on the very burning agenda. 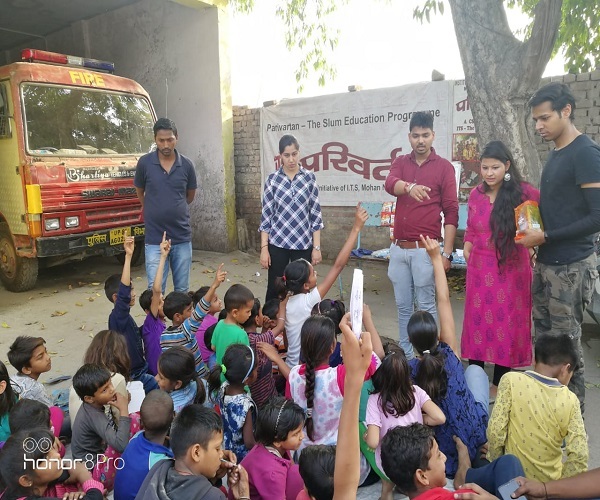 ‘Parivartan’ – The Slum Education Programme of Department of Management at I.T.S Ghaziabad organized activity on 7th April, 2019. Ashish started the proceedings with a unique lesson on movement, locomotion, and how to distinguish between them. In this context he referred to the movements found in small creatures like earthworms and snails. He, along with other volunteers like Anand, demonstrated how movement can be different from locomotion. Pragati then took over for the next section, where she discussed an important issue – the difference between good touch and bad touch. Children need to be protected from such uncomfortable situations, and so figures and demos were used to explain what is acceptable and what is not. The last part was dedicated to the importance of a major natural resource – water. Ashish & Anand returned to explain the different sources of water and why it has become imperative to protect a fast depleting resource like water. He also discussed rainwater harvesting, and how it can be used to combat the wastage of the precious resource. As usual, a quiz was used to revise the day’s learning, with those giving correct answers being rewarded with "Crax curls". 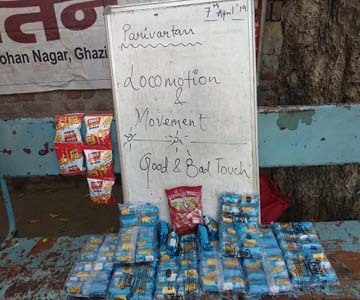 The day’s classes came to an end with the distribution of ‘Britannia Good Day’ biscuits and ‘Parle Orange Bite’ toffees. Web Club @ Department of IT organized a workshop for students of MCA IV Semester on Angular JS on 6th April, 2019 in Lab-1 of the institute. What is Angular JS? 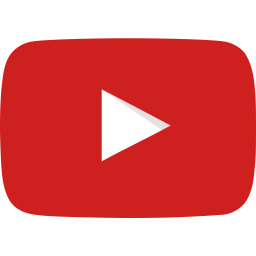 Why do we use Angular JS? What are the dependencies for Angular JS? What is Thick Line application and Thin Line Application? How to install NodeJS and Angular JS? How to write the program of Angular JS? Mr. Kaushik also demonstrated an application developed using Angular JS. Students were also instructed to develop an application. Session was interactive and students enjoyed the session a lot. 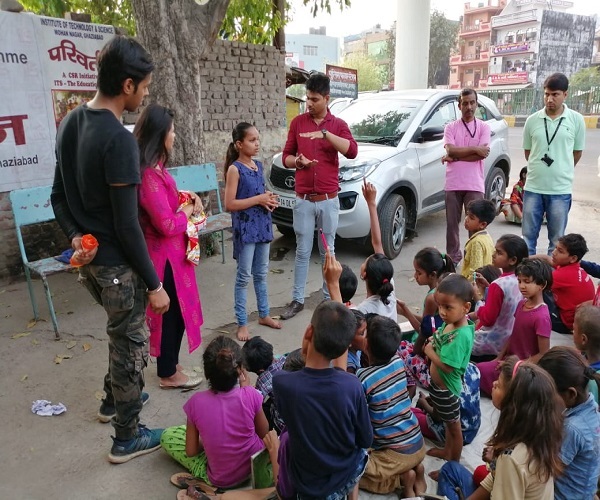 who is currently working with a NGO in USA – Lead in heels which funds NGOs working for women and children in South Asia. She is also an advisory board member of the NGO-Saambhavi (Delhi) working for differently abled. She had a wonderful experience as an instructor for management graduates for 14 years in various management institution /University in Delhi, NCR and Punjab. 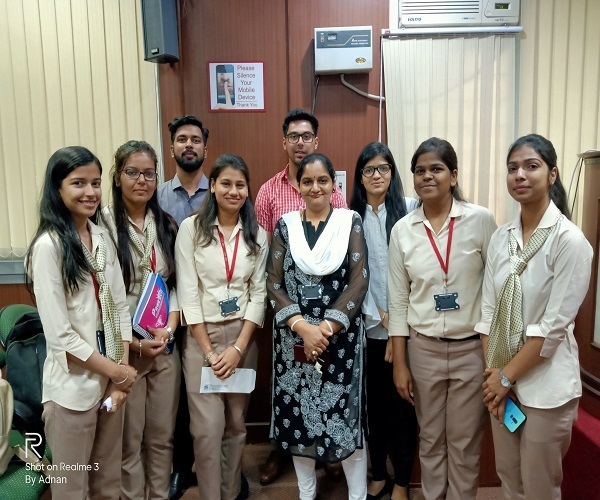 She interacted with the students on broad parameters of growth, career advancements, necessary personality traits required to succeed in the ever changing business scenario, various opportunities at national and international level. Students came up with many queries, which were taken up well in the session. 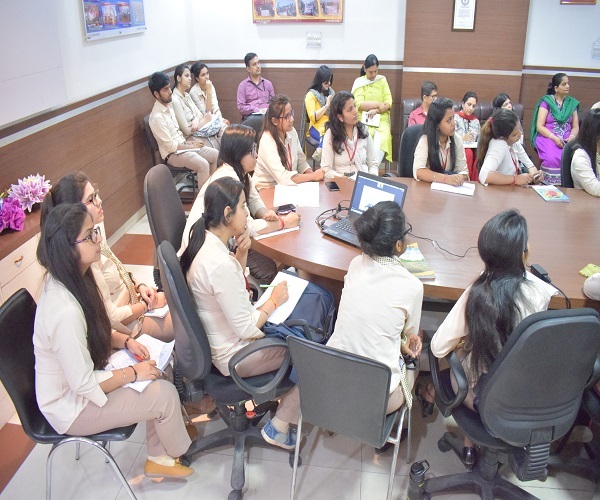 Department of Management at I.T.S Ghaziabad organized Faculty Student interaction with the delegates of IDRAC business School France - PAN India Pune center. The session was taken by the Academic Director, Mr. Charudatta Bodhankar, The main objective of this session was to appraise the students about Socio –Political – legal environment in European Union continent in general. Specifically, about the business opportunities in France and its neighboring countries. Students were briefed that France shares borders with six different countries, namely Spain, Luxembourg, Germany, Belgium, Italy and Switzerland. As a leader among its European neighbours, France is also among the most advanced countries in the world. The prominent companies such as Renault, Air France, France Telecom and Thales are among the world’s best among others. The government’s strong hold however is predominantly found in the power, defence and public transport industries. Students’ fruitful interaction with the delegate was very well appreciated. IDRAC business school offers learning opportunities in the area of International Business management, Wine Management, Hospitality Management, Luxury management among along with internship provision for the same. Department of Management of Institute of Technology & Science, Mohan Nagar organized Alumni session “How to pitch for Job in Pharmaceutical Industry” for MBA 18-20 Batch. This session was organized under Alumni activity “Samanvay”. 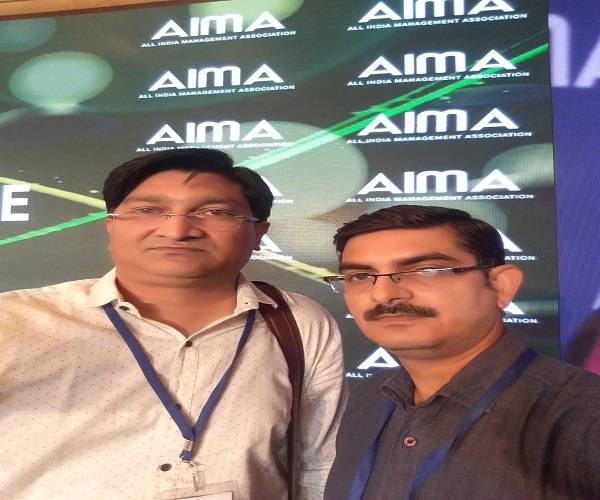 The session was addressed by Mr. Nilesh Srivastava , Area Business Manager, Astra Zeneca and Mr. Om Prakash Rai, Senior Business Manager, Abott of MBA 2005-07 Batch. The session was started with the address of Dr. Ajay Kumar, Director- Management. In his address he emphasized on the selection of right combination of subjects for specialization. He told students that this selection of subjects will decide their career path. Mr. Om Prakash Rai shared his job profile which is not known and common in pharmaceutical industry. He told students he is working for cracking big tenders for Abott. His main role is to bring bulk business for the company. 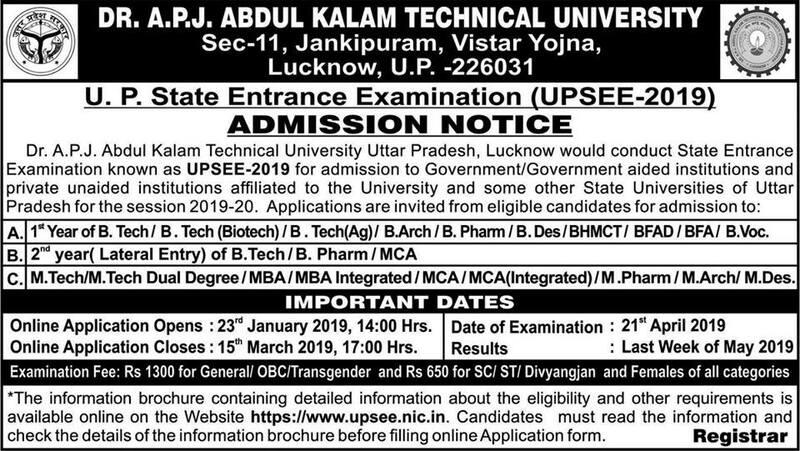 He also cleared the doubts that now pharma companies are ready to take students who are even not having science background. 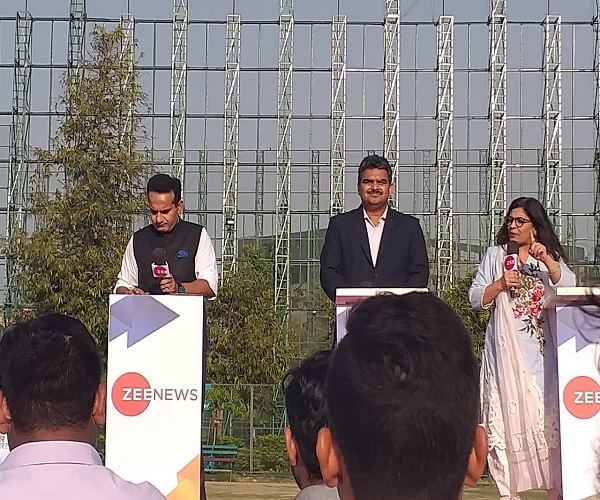 Mr. Nilesh Srivastava discussed with students that he is dealing only in one product for last 5 years and because of this he has pioneered that product line. This helps him in getting good job proposal from international companies. He concluded that students have to work hard in initial phase of 3 years and must pioneered themselves for getting standing in industry. At the end all the alumni’s motivated the students for targeting pharmaceutical industry and also guided them how to prepare for available profiles in industry. 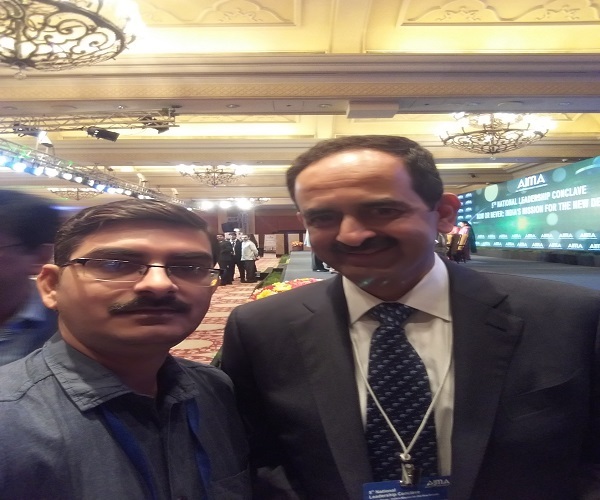 The session was coordinated by Dr. Nitin Saxena. The main speaker was Mr. Indrajeet Sengupta, the Executive Director of Hindustan Coca Cola Beverages (HCCB). The main topic was “Changing Faace of Recognition and Award and Future Ready Workforce Engagement Strategies.” During the course of the seminar Mr. Sengupta touched on topics like the system of feedback followed in India compared to those in other countries; careers, priority and engagement; value capabilities of tomorrow; linking engagement to rewards and recognition; finding inspiration and taking action; and encouraging peer to peer relations. The webinar was highly interactive and informative. 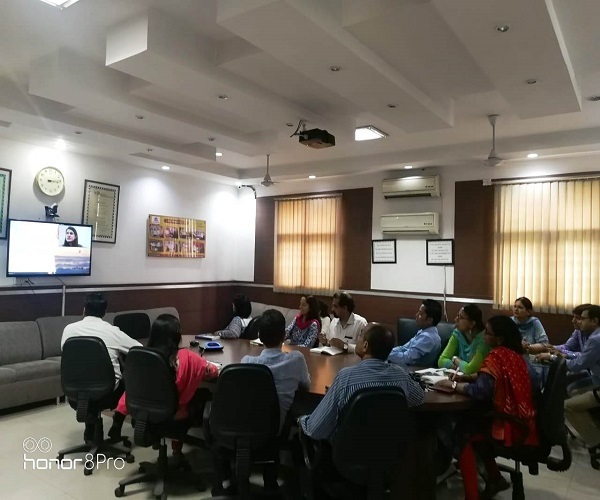 Faculty members attended the webinar along with 28 students from MBA First Year. 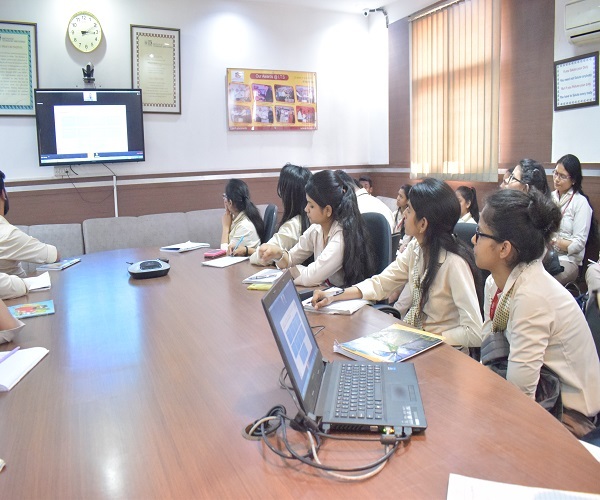 The students felt highly motivated and enthusiastic after attending the webinar. 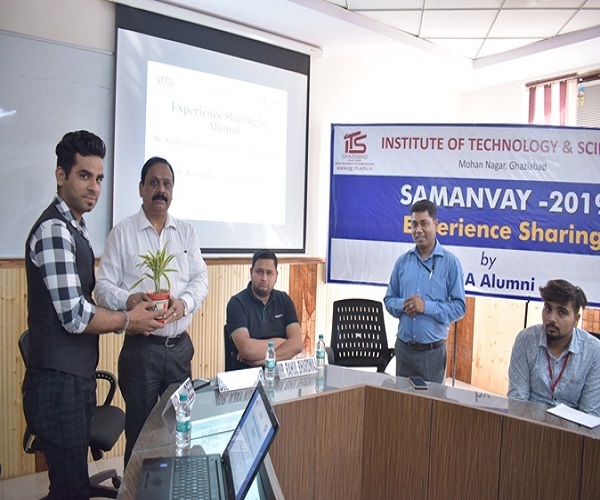 Samanvay- 19 organized Experience Sharing Session by MBA Alumni Mr. Navdeep Singh & Mr. Rahul Bhardwaj. 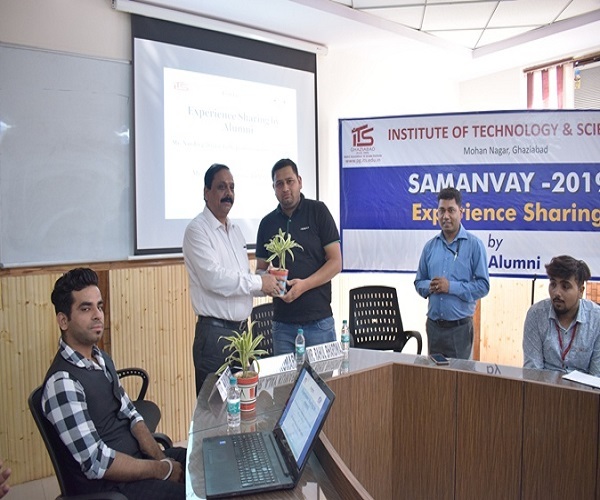 Department of Management at I.T.S Ghaziabad organized an experience sharing session under SAMANVAY 2019. 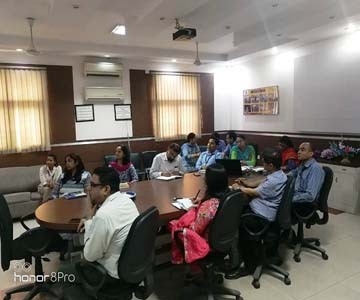 The session was organized for MBA 18-20 Batch on 1st April 2019. 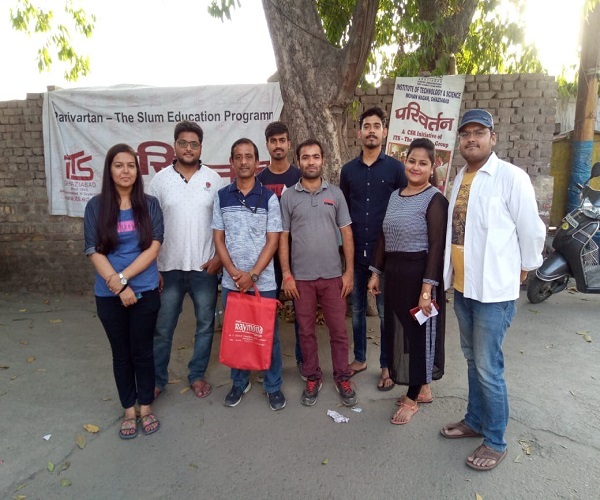 Alumni for the session were Mr. Navdeep Singh, Entrepreneur & Social Worker (MBA 2012-14 Batch) and Mr. Rahul Bhardwaj, Territory Sales Manager, OPPO Mobiles (MBA 14-16 Batch). The theme for the session was “Role of SIP in Final Placement”. Interaction was started with the welcome address of Director Management- Dr. Ajay Kumar. In his address sir explained the importance of session by Alumni. He asked the students to take maximum benefits of such sessions. Mr. Rahul discuss that the first ladder of placement starts with the selection of specialization in second semester. He told students that students must go for summer internship with the intension of learning not just for certificate. He shared his experience of hard work he did during his SIP in Sharekhan. Mr. Navdeep discussed that presence in class is importance for achieving expert knowledge in any field. He motivates students to become entrepreneur and to work for society. He shared that he started with very small venture of printing visiting cards and now he is into printing many products like flex, marriage cards, promotional items etc. The session ends with healthy interaction and lots of learning for the students.